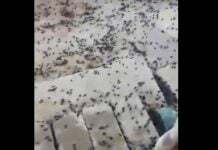 Home Animal Insect Plague It’s raining spiders in Brazil! It’s raining spiders in Brazil! Espírito Santo do Dourado, southern region of Minas Gerais, Brazil, beginning of January 2019… And it turns out this unexpected event is perfectly normal. 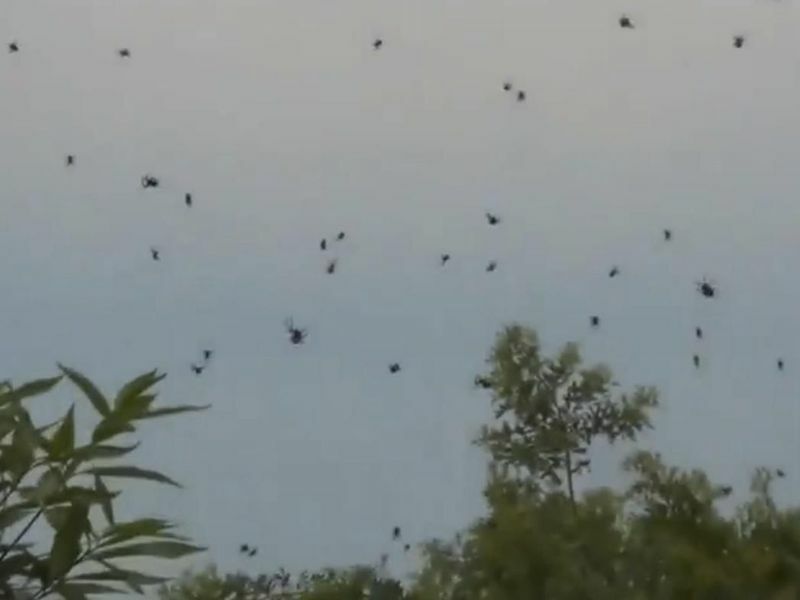 It’s Raining Spiders in Brazil A video captures images of thousands of spiders raining down on a Brazilian town, but it turns out this event is perfectly normal. While Europe and the US may be prone to blizzards this time of year, but in Brazil it’s raining spiders. In videos that’ve covered the Internet like an immense web, a student and his grandmother capture images of thousands of spiders shimmying up and down silk threads attached to telephone pole wires. 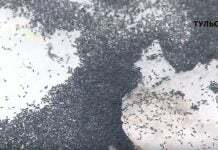 The footage gives the distinct impression of a shower – or perhaps light snow – of spiders sprinkling down on the shocked residents below. Totally weird, no? According to biologists, however, the phenomenon is not so strange as this type of spider is known to be quite social. They are usually in trees during the day and in the late afternoon and early evening construct sort of giant sheets of webs, in order to trap insects. Scientists have described around 40,000 species of spiders around the world, but only a handful of them are social. 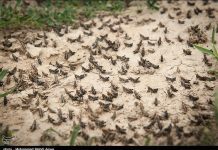 These 23 species are scattered around the world and sometimes swarm, like ants or bees. Females often outnumber males 10 to 1 in colonies that can exceed 50,000 individuals. In Minas Gerais, Brazil, it’s not an unusual site to see a sky speckled by spiders. The species, Anelosimus eximius, can be found from Panama to Argentina and lives in colonies sometimes comprised of thousands of individuals. Each spider is around the size of a pencil eraser. Their webs can stretch from the ground up to tree canopies or human constructions 65 feet high. If strong winds come along, the web may detach from its anchors, carrying the spiders and their ruined home to new sites where they appear to “rain down.” Like in the videos. While the humans gawked below, the flustered spiders were simply trying to pull themselves together after an unexpected journey from some forest or park. It’s worth noting that similar colonies live in Texas. In Lake Tawakoni State Park, just east of Dallas, Guatemalan long-jawed spiders construct enormous webs covering up to 600 foot stretches. The spiders build the huge webs in less than two weeks. Researchers think the spiders achieve such sudden engineering feats thanks to their remarkable reproductive capabilities and ability to disperse by ballooning. Others in Australia. Well keep your heads to the sky! It’s raining spiders! This whole sky resort area is a part of Reptilian facility. They have also impressive Reptilian Mountain Base on the top of the sky resort. This whole mountains around here have the nest of Reptilian Secret Underground Base. Again, a disaster hit Indonesia! Why so many disasters keep hitting mainly Indonesia?